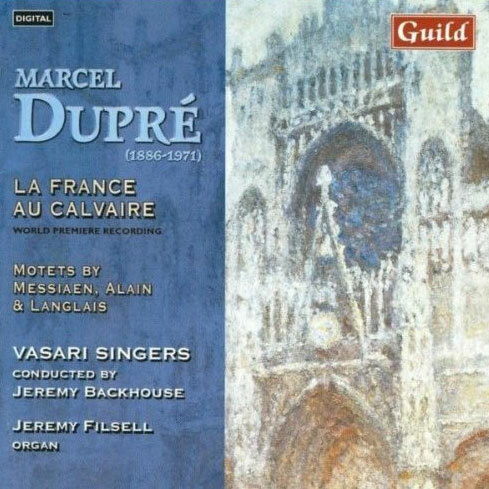 Dupré: La France au Calvaire – Organists’ Review - "...this is a work of major significance which is given a blazing performance by the Vasari Singers and Jeremy Filsell." Langlais’ Festival Alleluia gets this disc off to an invigorating start – the rhythmic vitality here is most inspiring. The Alain piece captivates with its simplicity and the Messiaen conveys a contemporary atmosphere by setting a melismatic treble line over harmonies in the under parts which turn out to be mostly major chords. Dupré’s cantata was written to celebrate the restoration of Rouen’s restored cathedral and its libretto consists of a Prologue in which an allegorical figure La France kneels at the foot of the Cross and begs the dying Christ to forgive her countrymen their sins. In the succeeding movements, six French saints support her plea and the movements are entitled Saint Denis, Sainte Clotilde, Saint Louis, Joan of Arc, Saint Vincent de Paul and Sainte Thérèse. Written for vocal soloists, choir and organ, this is a work of major significance which is given a blazing performance by the Vasari Singers and Jeremy Filsell. The issue of this world premiere recording is an event of major significance. Dupré: La France au Calvaire – Church Times - It’s a deeply passionate work, richly chorded. I much admired the Vasari Singers’ Gramophone Choice Guild recording of De Profundis (GMCD 7220), Marcel Dupré’s setting of Psalm 130, composed late in World War I and dedicated to France’s soldiers who died in that carnage. La France au Calvaire (GMCD 7239) is Dupré’s even more powerful response to the Second World War, especially the devastation of Rouen, and was composed for the reopening of the city’s restored Norman cathedral. An oblique, poetic text begins at the foot of the cross; what follows is a fascinating, medieval-infused evocation of France’s patrons, St Denis, Ste Clotilde, the sainted King Louis, Ste Thérèse of Lisieux, and Joan of Arc. It’s a deeply passionate work, richly chorded; and Jeremy Backhouse’s Vasari forces, abetted once more by the considerate organ texturing of Jeremy Filsell, deliver a deeply affecting performance in this first recording. The darkly glowing tenor narrations are exquisitely sung by Matthew Beale. Midway the work marginally loses momentum, regaining it in the finale, in the ringing solo evocations of a personified France and Christ himself. A fine discovery, tenderly sung and beautifully recorded. War and destruction. The main work on this enthralling CD of 20th century French sacred vocal music, is Marcel Dupré’s one hour oratorio: “La France au Calvaire” (1952/53). The libretto reflects on the destruction of Rouen, in the Second World War, through a series of allegorical scenes with holy figures. Dupré’s composition varies between excited unison drama and meditative passages. At the same time, it uses expressive, strongly chromatically enriched harmonies. The choir has sound intonation and attributes great attention to dynamics and articulation. Dupré: La France au Calvaire – Classical MusicWeb - The recording is resonant but well balanced clear and airy. Guild might well be labelled, or claim to be, ‘The Dupré Specialist’, having recorded all his solo organ works. Dupré did not consider himself a ‘composer’ in the orthodox sense. The usual informative Guild booklet quotes his self deprecating comments, made in 1942 at the height of his career:- ‘I do not think of myself as a composer … I have specialised in the organ, and I do not have the reputation that composers have’. That is as maybe, but the major work on this CD, claimed as ‘A World Premiére Recording’ is his Opus 49 written in 1952-53. It was written, like his other major choral work, ‘Die Profundis’, in response to the ravages inflicted on the people of France by two World Wars; in this case in response to the devastation wreaked on Rouen Cathedral by Allied bombing. It was also a tribute to Dupré’s birthplace and was completed in time for the joint celebration of the restoration of the Cathedral and the 500th anniversary of the official pardon of Joan of Arc in 1956. The movements of the work are dedicated to six French saints plus ‘Prologue’ and ‘Final’. The full French texts are given with English translation. An extract from Au Calvaire appeared on this label, with the same forces, in the autumn of 2001, and was justifiably acclaimed. Here, the full work is dramatically overwhelming with the choir moving through many emotions with well-articulated sonorous singing. The organ accompaniment receives full due in this recording but it is the musical marrying of the choir with the instrument that makes such an impact. The male soloists could be steadier (tr.1 and 2) whilst the soprano floats her ‘Sainte Clotilde’ (tr.6) on a silvery tone of voice. The mezzo, as ‘La France’, is grander in tone and declamation (tr.11). Above all it is Jeremy Backhouse and the Vasari Singers that make this work an overwhelming experience. I am all in favour of filling discs. My first thoughts were that the three motets should have been placed to follow the Dupré. Second thoughts prevailed; the motets would sound even more trite in comparison with the main work. They are worthy, but distinctly lesser works. Nonetheless they are given the full ‘Vasari’ treatment and benefit from it, as does our enjoyment. Dupré: La France au Calvaire – Gramophone - Editors Choice - An extraordinarily powerful work, born out of fury, superbly performed. Although the Vasari Singers have already given us a taste of “La France au Calvaire”, this is the first time the complete work has appeared on disc. And an astonishing work it is, too, setting, to quote the booklet note “a curious libretto” by Rene Herval who, like Dupre, was a native of Rouen. Appalled by the devastation wrought on his native city during the Second World War, Dupre vents all his anger and passion into this 65-minute oratorio, its movements dedicated to six French saints and framed by a Prologue and Final. Principally known for his organ music, it might seem strange to question Dupre’s use of the organ here as the sole means of instrumental accompaniment. But despite Jeremy Filsell’s stunning virtuosity and brilliant handling of the not-always-perfectly-in-tune Douai Abbey organ, I can’t help feeling that the score cries out for an orchestra. No such reservations about the performance: in a word, stunning. The bleak ugliness of Christ nailed to the cross is compellingly portrayed by Matthew Beale, Catherine Denley makes an arresting France appealing for forgiveness for her misguided people, Colin Campbell fulfils the dual roles of St Denis and the voice of Christ with suitable gravitas and authority, and Helen Neeves is a beautifully innocent St Clothilde (magically set against a decidedly Massiaenic organ backdrop). As for Jeremy Backhouse and his superb Vasari Singers, they excel even by their own high standards. The men evoke suitably violent Barbarians as they call for Christ’s death, the women provide a moment of absolute wonder as they sing to St Theresa, and the enitre choir moves from the passionate followers of Joan of Arc, through the gloriously triumphant (“Le Christ est encore”), and the miserably wretched (“J’ai faim”) to the luminously prayerful (“Saints, martyres, phalanges”). The three motets which share the disc seem in comparison a trifle disappointing: Langlais’ “Festival Alleluia”, despite opening with great verve and spirit, overstays its welcome by a good sic minutes; Alain’s gentle “O Salutaris” is really little more than an exercise in Bach-style chorale writing; and, for all it’s stature as a 20th-century choral classic, Messiaen’s “O sacrum convivium” here lacks a sense of mystery. But that disappointment is only because the motets precede a work of extra-ordinary emotional impact and a performance of exceptional power. Dupré: La France au Calvaire – classical.net - This is a thrilling disc full of some pretty fantastic music that deserves the strongest possible recommendations. The main work on this well-filled disc is an intriguing premiere recording of Marcel Dupré’s oratorio entitled, ‘La France au Calvaire’ written after the destruction of Rouen in the 2nd World War. It is an imposing piece of great beauty and sets the lives of several famous French saints in a choral and organ clothing and context. Amongst the most spiritually edifying are the pieces dedicated to Saint Clotilde, Saint Vincent de Paul and the innocently captivating Saint Therese. There is a certain spirit of defiance caught throughout the work that is well captured by the group performers under Backhouse especially the much underrated soprano, Helen Neeves who is quite ravishingly captivating. I was deeply moved by Dupré’s music which manages to convey an intimate sense of spirituality matched by irresistible momentum and intensity of feeling. The accompanying pieces are, of course, of a shorter provenance but are still very valid. Jean Langlais complex ‘Allelulia’ is a brazen call to faith whilst the intimacy of Alain’s ‘Salutaris’ makes us mourn his loss on the battlefield in 1940, that darkest of years for France. Messiaen’s ‘O sacrum convivium’ is an early work that does not lack anything in the spiritual vigour of its successors. This is a thrilling disc full of some pretty fantastic music that deserves the strongest possible recommendations. Dupré: La France au Calvaire – Classical MusicWeb - The soloists are very good, with clear diction and cope well with demanding roles. The main work obviously on this disc is the Oratorio by Marcel Dupré “La France au Calvaire” (France at Calvary), inspired by the destruction suffered in Rouen during the Second World War (Dupré was born in Rouen); he completed this in time for the joint celebration of the restoration of Rouen Cathedral and the 500th anniversary of the official pardon of Joan of Arc in 1956. The libretto, written by another native of Rouen, the poet René Herval, is curious; it begins with the allegorical figure of La France kneeling at the foot of the Cross, begging the dying Christ to forgive her countrymen their sins. In support of her plea, the six succeeding movements present a procession of French saints through the ages. The Finale returns to Calvary where La France repeats her prayer of the Prologue and is answered by Christ on the Cross. Dupré did not consider himself a composer, and was first and primarily an organist, and obviously a very good one – he performed the complete organ works of J.S.Bach from memory in the early 1920s. He came from a musical family, and studied at the Paris Conservatoire under Widor. In style he is removed from the other French modernists, and listening to this work, the impression I gained was one of César Franck transported into the 20th century. The work has four soloists, chorus and organ, the latter part being a tour de force. The soloists are very good, with clear diction and cope well with demanding roles; the only slight criticism I have is of the baritone, Colin Campbell, who has a marked vibrato, which is just short of being intrusive. Catherine Denley is of course well known and gives her usual sound firm performance, and both the tenor and soprano leads are held well, both with clear fresh voiced soloists. Jeremy Filsell at the organ has the job of acting as anchor man and continuo, and performs this unobtrusively and competently; the organ volume is well adjusted and does not drown either the soloists or the choir. I am not an organist and thus cannot comment on the registrations used, but certainly the effect is very satisfying. The Vasari Singers are a very competent and justly respected choir; they were formed in 1980 by a group of friends from the London Symphony Chorus, and named themselves after Giorgio Vasari (1511-1575) a musician, architect, artist and critic in sixteenth century Italy. They thus committed themselves to performing Italian polyphony, but as their numbers increased their repertoire widened, and they now embrace a wide spectrum of music. For this programme, from their photograph, they number 31 and give an excellent account of themselves. They are virtually semi-professional these days, and their expertise is reflected in the way in which they cope with Dupré’s score. I cannot say that I enjoyed the work, rather that it was a most interesting experience to hear this unusual oratorio; I would not want to listen to it again, but I’m grateful for the chance of experiencing it. This, together with the other items on the disc are likely to prove of interest to a student of modern French choral music. In fact, apart from the Messiaen, none of these works is otherwise represented in the current catalogue. Jean Langlais studied at the Institute for Blind Youth, and later entered the Paris Conservatoire, studying organ under Dupré. He later took up an appointment at the Sainte Clotilde church in Paris (previously held by César Franck and Tournemire). The motet Festival Alleluia is scored for choir and organ, with optional timpani and trumpets. It consists of contrasting sections singing for almost 7 minutes to the one word “Alleluia”. I found the whole work tedious because of this, although the singers and organ performed more than adequately. I am probably missing some finer points, but it was not for me. Jéhan Alain was killed in action in 1940, aged only 29; O Salutaris is a short motet beautifully crafted and sung. It has been adapted by his sister, the renowned organist Marie-Claire Alain. It is a very peaceful, easily accessible piece, again well performed, and which I enjoyed most of any works on this disc. Olivier Messiaen’s O sacrum convivium is scored for a capella choir, or soprano and organ; the choral version is performed here, and again with aplomb by the Vasari singers. I could not get to grips with this piece, but then Messiaen was ever my bête-noire and attempts to understand and appreciate his music in the past have been accompanied by failure! The recording for all works is up to Guild’s usual high standards, and reproduction and balance of parts is very natural. In total a disc for specialists or those liking the unusual in repertoire.